It's finally time to take a look at the Lamy aion. I originally intended to write a review immediately after the release. Well... in the end it took me a lot longer than expected. Theoretically that's a good thing though: the longer I take to write a review, the better I like the product! In case of the Lamy aion, that rule certainly applies. 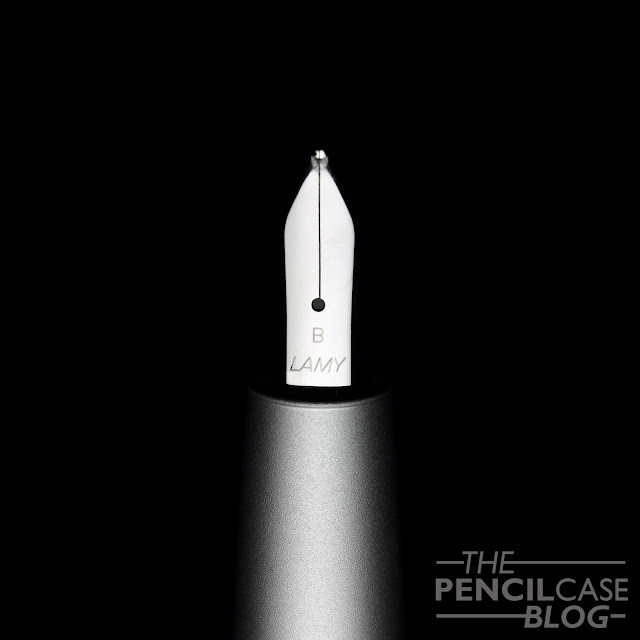 The Lamy aion faced somewhat of a cold, 'meh' response when it was first announced. My reaction, on the other hand, was definitely filled with a lot more excitement. I'm quite partial to the brand of course, I'm sure you know if you've been following this blog for a while. So don't take my word for it. Lamy receiving flak with new releases seems to be a recurring theme (Remember the debacle with the 2000 Anniversary Black Amber?) When Lamy announced the aion, it was immediately written off as the lovechild of the Lamy 2000 and Studio, a pen that -I quote: "lacked creativity". Honestly, I never really understood the comparison with the 2000 and Studio in the first place, because they are nothing alike in my opinion. But most of all, I thought the criticism about the lack of creativity was rather unfair. Lamy is known for pure and minimal designs. It's their style and that's either something you like or not. If you expected flashy materials (ok, ignore the Safari and Al-Star for a moment) or elaborate details, that was guaranteed to end up in disappointment. Let's cut straight to the chase: I think Lamy did a fantastic job on this one. 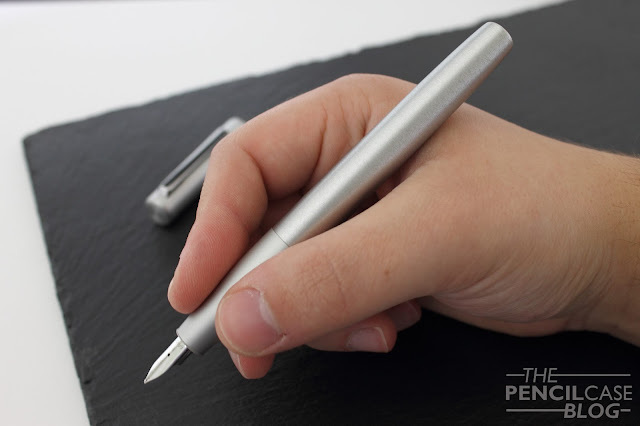 It's not a design to turn heads, but again that's not Lamy's style. It's large -I'll get back to that in a minute- yet in all its' robustness and bulky appearance, they managed to make it appear elegant and sleek. If anything, it's not the symbiosis of the Studio/2000 but the design style of Apple products that this pen reminds me of. 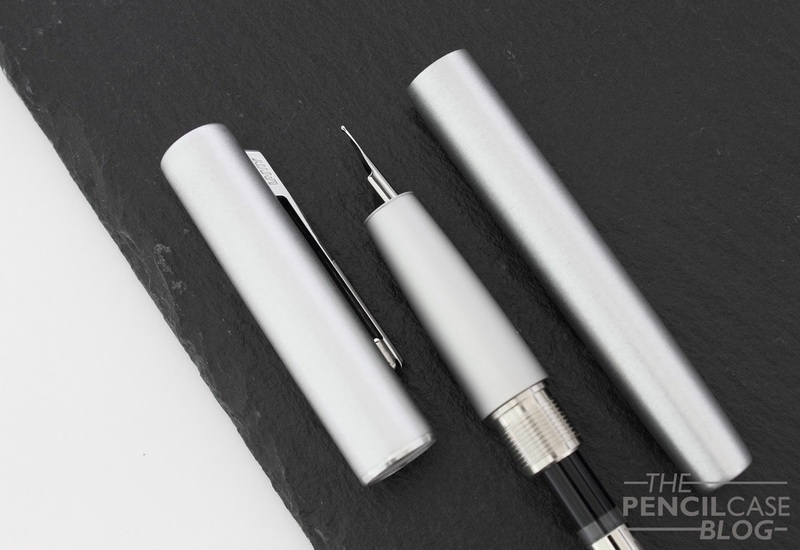 The deep-drawn unibody aluminium barrel and cap give the pen a seamless look, as does the monotone color and use of multiple textures. I really like how they worked with contrasting finishes: brushed aluminium on the body and a satin finish on the grip section. It combines nicely and is finished with a contrasting chrome-plated ring on the cap. 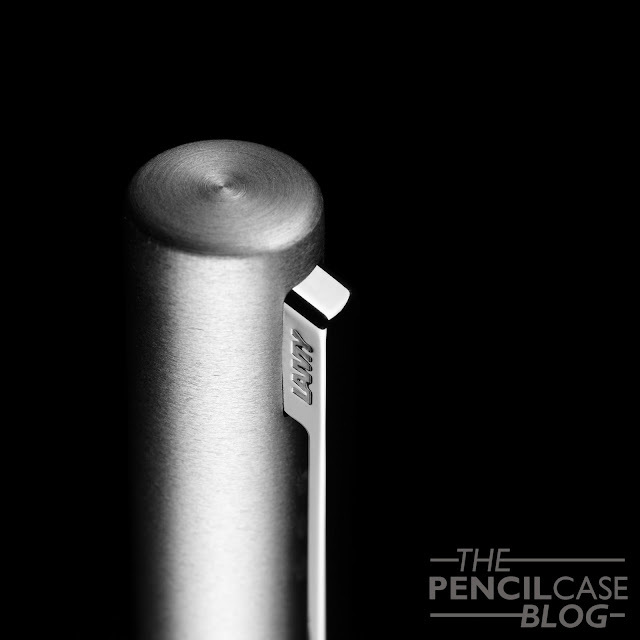 The simple, rectangular clip is somewhat similar to the one on the Lamy CP1, but has more rounded corners. Actually rounded corners are quite the central theme on the aion. 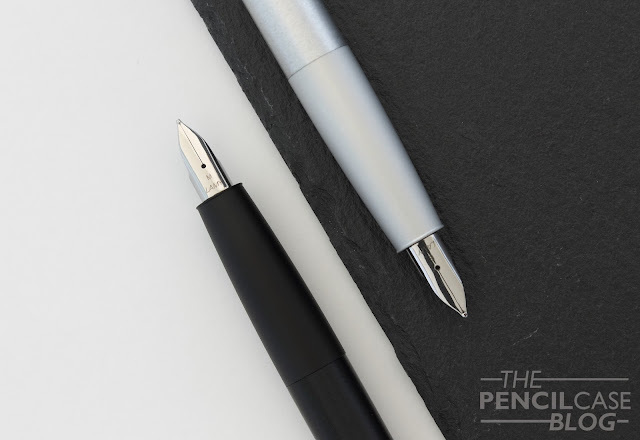 Between the rounded finials on the cap and barrel, and the rounded edges on the clip, it also marks the introduction of a new nib design with, you guessed it... a more rounded profile! All in all, the nib doesn't look much different from the standard one. But I have to admit that it works together nicely with the rest of the design elements on this pen. The aion is a pretty complete package with a very minimal, peaceful design. Regardless of what some may think of it, I think the design is quite on point. The only part about this pen I don't like is the name of the silver version: 'Olive Silver'?. I don't know where they came up with the 'Olive' part, it's just silver. 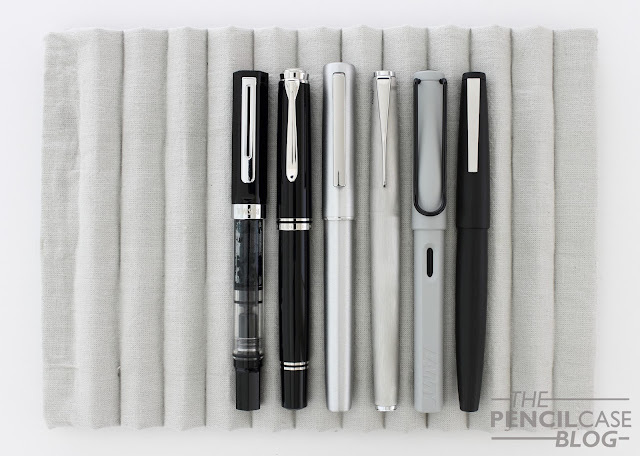 L to R: TWSBI Eco, Pelikan M805, Lamy Aion, Lamy Studio, Lamy Safari, Lamy 2000. As I mentioned earlier, the aion is quite a large pen. It measures 14.3 cm (5.6") closed, and 13.7 cm (5.4") uncapped. It's not an overly girthy pen, with a grip section that averages at around 11 mm (0.43"). The aion has a completely metal build, and especially the solid metal section adds quite a bit of heft to give a total weight of 33 grams. In terms of comfort, the aion is about as good as it gets! A long pen weighted around the section and no threads or step to interfere with your grip. It would've been even better if the section had the same subtle brushed texture as the rest of the pen. The satin finish is nice to hold, but it gets a touch slippery at times. Now for that new nib. It really isn't that much of a difference from the old one in terms of performance. I've heard people find it smoother than the normal ones, but in practice I found little to no difference. That's not a bad thing though, I always enjoy using Lamy's nibs. The steel nib strikes a fine balance between smoothness and feedback. Lamy nibs typically aren't overpolished, which in turn makes them reliable and consistent writers. That's what they are: simple, no-nonsense reliable performers. No fuzz, just like their designs! The best part about the aion, I think is the affordability. The aion comes in at 49 EUR (71.2 USD), which positions it in between the entry-level Al-Star and more 'premium' Studio. Given the excellent, sturdy metal build quality and sleek design, I think that's a very fair price point, and it's worth your consideration if you're looking for an upgrade over the Safari or Al-star. GIVEAWAY CLOSED! NOW FOR THE BEST PART: YOU CAN WIN A BRAND NEW LAMY AION FOUNTAIN PEN FOR YOURSELF, COURTESY OF CASA DELLA STILOGRAFICA! ALL YOU HAVE TO DO IS ENTER IN THE RAFFLECOPTER WIDGET BELOW. GOOD LUCK! RULES: Giveaway ends 4/1/ 2018. Winner will be chosen via random.org, and announced in a separate post. The winner will be contacted directly via email, if he/she fails to reply within one week, a new winner will be picked. Only entries with valid email address are eligible to win. Invalid entries are denied. Note: I received a discount on the purchase of this product from sponsor Casa Della Stilografica. I was in no way influenced in the making of this review, the opinions shared in this review are completely my own! This post does not contain affilate links. The pen that I would love to have but can't afford would be a Sailor in that navy/blue color. So Classy! Really nice review! I hope I can find someone who owns one so I can try it for myself. I've really like the design of this pen as well, so would love to try it out soon. Nice review and makes me want to try one! Nice write-up! I really like the design of the Aion too :) After watching the Lamy videos from Brian Goulet’s visit I have an even greater appreciation for Lamy. Very thorough and well thought out review. Thank you for the giveaway! I’ve always admired the Conids. Thanks for the opportunity. This pen looks pretty good. My grail pen is the Pilot Custom 823, but this would be great to win. The Aion is actually one of my wish list pens. I collect mainly low end student and "disposable" fountain pens. I have 3 or 4 Lamys already, but no Aions. I'm too early in the fountain pen rabbit hole to have a Grail pen, but I am a Lamy fan, and I'd love to win this! Great post and great blog glad I found you on Instagram. My current pen interest is in flex nib pens, as I guess I always want something I don't have. I am interested in a retro Wahl Eversharp. I may find something else, but the older ones seem to flex up to 2mm, and the newer don't seem to do this. So, I am looking for a great flex pen to achieve some calligraphy style writing. Thank you! 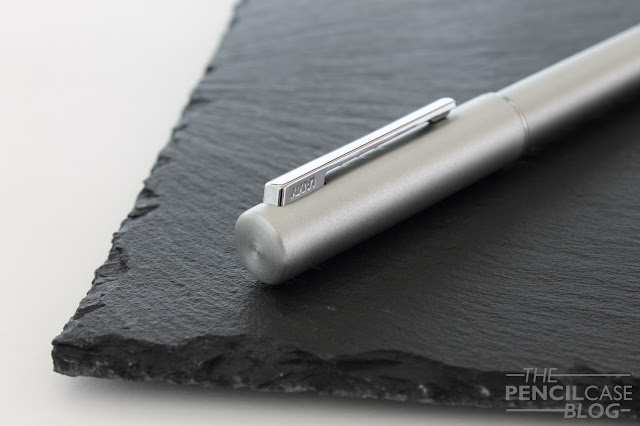 I have Lamy logo, which has the brushed steel look as Lamy Aion. I like this texture finish, it looks classy and modern, and it doesn't leave fingerprints and tiny scratches. This pen looks so sleek. I’m trying to appreciate the Lamy minimalist style more, and this pen helps! This is the first review I've seen on the Aion. It is a pen in the tradition of other Lamy pens - not flashy, but I really like that. Thanks for the review. I would love to try one of these pens. Thanks, nice review. I will drop by my usual shop to give it a try. I hope they have an EF. An interesting entry at this price point - I can see it getting on a lot of 'next pen' or even 'first pen' lists, for a pen that's stylish and classical but not way over $100. Nice pen at an affordable price. It probably won't substitute my lamy 2000, but fantastic as an EDC! Thanks for the detailed review. I like the sleedk design of this pen. I am just getting ready to fill my Lamy 2K with the radioactive Noodler's Bay State Blue. I'm terrified...somehow this Aion seems like a better choice for a designated BSB pen? This pen is very minimalist. Excellent review! 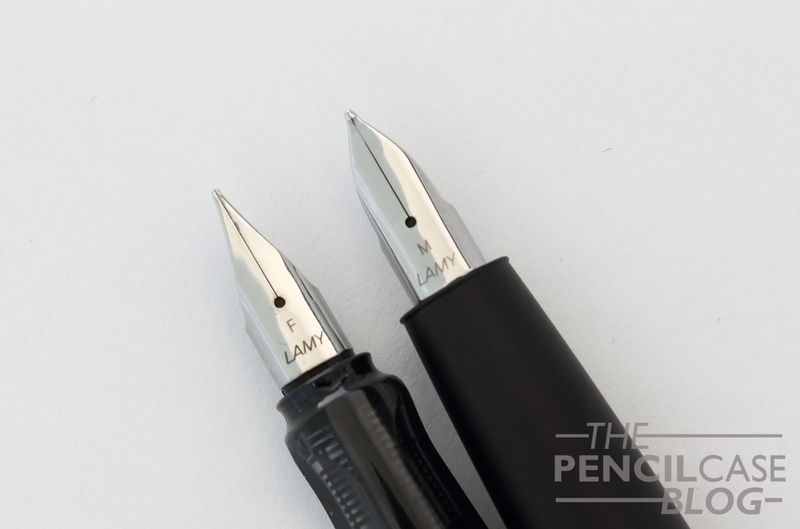 I agree with you in regard to expectations and the Lamy Brand. The Aion looks like a fantastic pen. Thank you! Great looking pen! I've truly been enjoying my Lamy Safari with the different nibs and I have been eyeing the more stylish models of the Lamy line in the recent weeks. Here's hoping! Test drove the Aion the other day, and I really like the fit and feel of it. Great German manufacturing. Wow I've always wanted to try the Lamy Aion! Love the clean lines of this. The silver is so pretty. Excellent and detailed review! Great to see the nibs side by side to get a better idea of the change with the aion. Thanks! Sorry, my name didn't show up on the earlier comment. 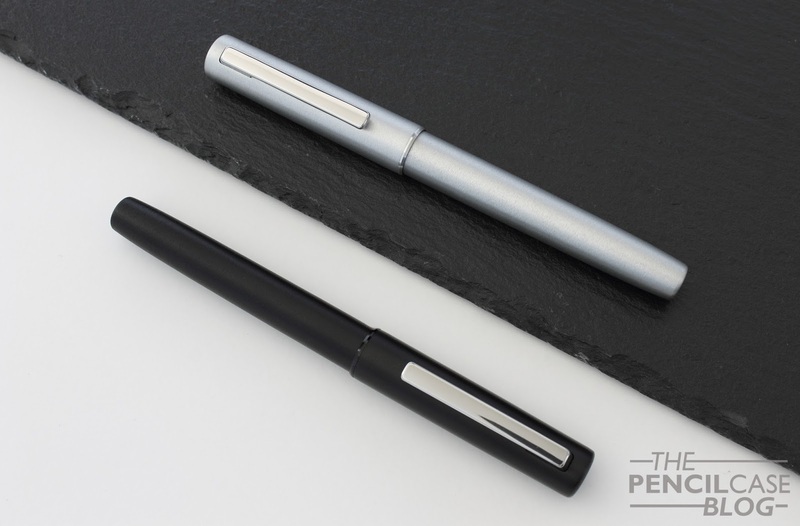 Another day, another Lamy pen I want desperately! My grail pen is a Visconti Homo Sapiens Dark Age. I have written with one on a few occasions at shops and pen shows. Every time I use one it feels perfect in my hand and the materials alone are quite unique and would make a great story. So I hope to one day own this amazing pen. This was a thorough review of a pen that didn't quite interested me, until now. Nice review! I like your handwriting. Went to a couple of local pen shops today and am reminded me of all the pens I can’t have. 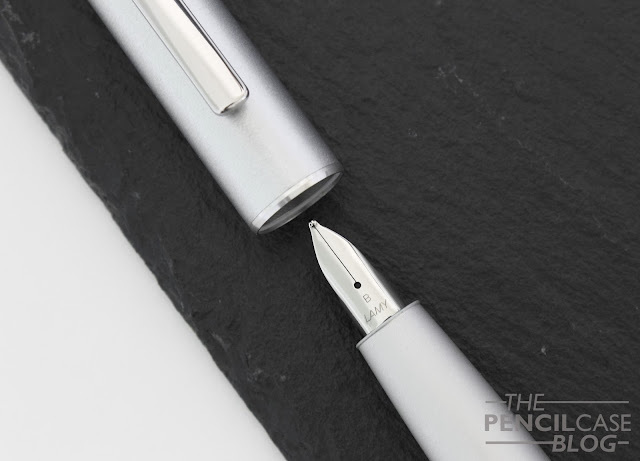 Drooling over Graf von Faber Castell right now! That was a great review! I have been thinking about getting on of these for awhile now. that silver squad of pens picture is iconic. The Aion looks like an amazing pen - though you're right, it's gotten some very negative press. Thanks for balancing the ledger - I'd love to give it a try! Thanks for the sweet review and giveaway! I’ve only tried the lamy lx pens but these aions look amazing! Hoping I can get my hands on one of these soon! Just got a TWSBI ECO-T in blue and some Blackstone Barrier Reef Blue. They make one fine combination. This looks like a great pen! I'm not a fan of the triangular grip on the Al-Star and Safari, but this might get me back to writing with a Lamy pen. I also love the minimalistic design, so I'm also quite baffled that it received such lukewarm reviews when the pen was first released. Dat zou leuk zijn! Mooi review! Great review! I tried this pen at the new LAMY store in San Francisco, and while I liked it, it didn't immediately wow me for the price. Perhaps it would grow on me if I owned one.